A crown is a cover for a tooth that is in a weakened state. The tooth shaped cover is cemented onto the tooth to protect it as well as to make it look better. The crown is made to fully cover the tooth and sit just above the gum line. We now offer CAPTEK™ crowns. Crowns are made of different materials. 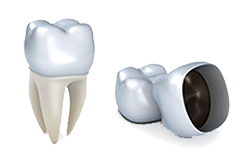 Permanent teeth crowns need to be made from durable materials such as gold or medical grade stainless steel. For teeth that would show, a porcelain-fused-to metal crown might be appropriate. Bridges are basically two crowns that fit on two teeth with false teeth in between to “bridge” the gap. The two teeth used to hold the bridge are anchors for the space saving device. The false teeth are made from materials like gold, porcelain or a combination of the two. Bridges help support existing teeth and keep them in place. There are three types of bridges. The Maryland bridge uses false teeth bonded to the remaining teeth. A Cantilever bridge is used when there is only one tooth on the side of the missing tooth. 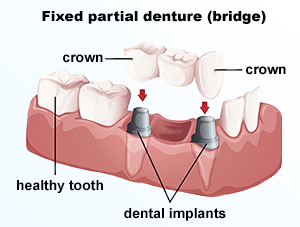 The traditional bridge consists of two crowns created for the tooth or implant with false teeth in between. This is the bridge most people are familiar with. Maintaining crowns and bridges is imperative to oral health. The gum tissue needs to be kept clean just as the rest of the mouth does. Inter-proximal brushes and flossing are keys to keeping the restorations in a healthy state. Bone and gum levels need to be kept healthy to maintain the restorations and the adjoining teeth. Keeping up with routine preventative visits is also important in keeping crowns and bridges in a strong and healthy state. Let Dr. Young and his staff make you feel good about whatever the dental decisions you choose. Keeping patients teeth strong and healthy is the ultimate goal at Silver State Dental.